You are here: Home / Blog Hop / Reverse Stenciled Technique, Blog Hop, And Giveaway! I am so excited to be hosting my first blog hop using my stencils designs from The Crafter’s Workshop. Most of my stencils are collage in style. Collage being my favorite medium, whether in paper, fabric or both combined. 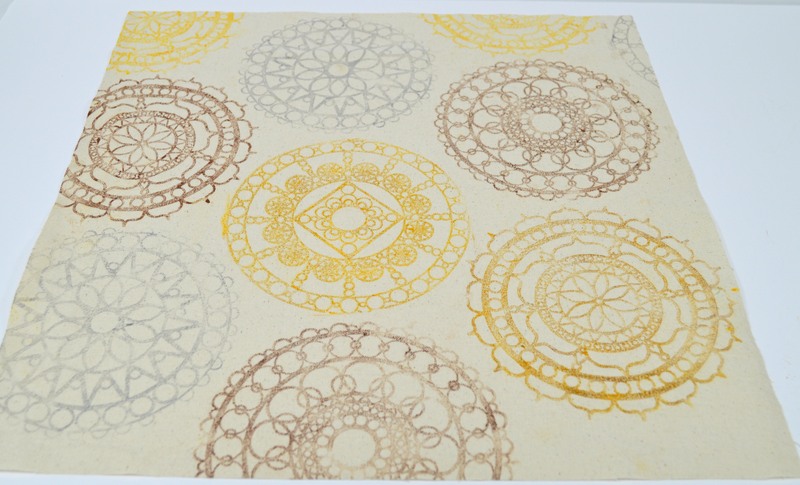 My other stencils are inspired by circles and Mandala (I love the art form) designs. Mandala’s for those not wanting to draw their own. I sent four 6″ mandala inspired stencils to nine of my creative friends. Be sure and visit each of their sites, I can assure you each designer’s creation will be awesome, unique, and varied in their mediums. I can’t wait to see what they come up with. I had a hard time deciding what I wanted my project to be. Sometimes thats the way it is, when you can create anything you want! Deciding upon a reverse stenciling technique, I went with demonstrating how a stencil can be used to create a print. Bypassing our dreary spring, summer has been on my mind. Thinking how nice and warm, sunny weather will be. I chose a canvas pillow that can be used both inside or outside. What do you create with stencils? Answer the question by leaving a comment below, and one lucky person will win my four new stencils, used for the blog hop! Enjoy the techniques and projects created all week by the talented designers in the hop. The random winner will be announced Saturday April 19, 2014. 1. Place canvas fabric square onto protected work surface. 2. Place stencil onto acrylic sheet or other protected work surface. Apply Colorbox® ink onto stencil with sponge applicator. 3. Flip inked stencil over and press onto canvas square. Place deli paper onto stencil and use brayer to roll across, printing design onto fabric. 4. Lift deli paper to reveal design. 5. Repeat steps 2-4 using each stencil and different colors of ink. Fill each canvas fabric square with reverse stenciled designs. Let dry. 6. Press each fabric square with dry iron. 7. Place fabric right sides facing. Pin to secure. Machine stitch 1/4″ from raw edge. Leave a 3″ opening to turn right side out. Clip corners 1/8″ from stitching, and turn right side. Stuff pillow firmly with fiberfill. I adore your stencils! This is a fun technique which I’ve used to clean my stencils but never as the primary design. Great idea! I use stencils on fabric and hand embroider over small sections. I started using stencils in my art journal, but have reverted to my first love of embroidery to incorporate both. I usually use spray on colour but will try your technique for my next project. I love your new stencil designs and the ways that you have shown using them including the tags and coffee filters. I have used my stencils for art journal backgrounds and with my gelli plate. You have inspired me to try some new techniques. Thank you for the chance to win your lovely stencils. I just created some stenciled designs using one large and 2 small mandelas to use as a fabric background for a hand embroidery workshop. Everyone ooo-d and ah-ed over these new stencils. I plan on some fabric wall art and pillows with these beauties. Keep the designs coming Rebekah! I used stencils for my journaling and mixed media canvas. I love your stencils. Your stencils are beautiful. I’ve had my eye on them ever since I saw them in one of those CHA sneak peeks. Especially the Rosetta stencil. I think that’d be a great one to use for a zentangled background. I’ve never actually tried stencils on any fabrics, mostly because I avoid anthing that has to do with sewing (know your limitations!) but I do love these stenciled pillows. I may have to give one a go. I use stencils for all sorts of things – cardmaking, art journaling, gelli printing, mixed media canvases and wall art pieces. They are so versatile! Thanks so much for the chance to win some of your stencils. Good luck with your new line. Your new designs are great and I would like to use them on textiles that I will sew up into garments. Hi Rebekah, your stencil designs are fantastic! I’ve used stencils in my art for +25 years and its been wonderful to see the resurgence in the use of them in the last few years. For those of us who love the effects that can be achieved with stenciling you have given so much inspiration through your blogs, books and teaching, plus added to the resources available by creating your own stencil designs for others to use. I have used stencils in my quilting and card making. I love making tags and journals and want to start using more stencils with these projects. Love the look of the reverse stencil! Would be fun to make some outdoor pillows for the yard! They would make some great Mother’s Day gifts. I love your stencils so am very much looking forward to seeing what the guest designers do with them! Going to go try out your design now. I love your stencils and am very much looking forward to seeing what the guest designers create this week! I use stencils with inks, sprays and pastes on cards and tags. Your stencil designs are beautiful. I use stencils in my card making, I’m just a beginner with them though, you’ve opened my eyes to lots of new possibilities! Love your stencils. Tammy’s tutorial really got me interested in adding them to my craft tools. I have been looking at stencils, but haven’t tried one yet. Thanks for the easy to understand tutorial! Hi Rebeka, I have for a long time loved your work and am ever so happy to see you get on board the stencil train! they are so much fun! With your stencils, I am going to make my daughter a canvas tote. She is always need ing them for groceries, books, lunch – whatever. Can’t go wrong with another canvas tote.When your stencils came available, I bought up the large and small collag-‘ie’ stencils…fell right in love with them! Anyway, the blog hop – did I miss something? I don’t see the links for the next hop…maybe it’s yet to come. Anyway, keep on coming up with these great ideas that inspire us like no other! What a fun idea…just in time for summer pillows and banners, and aprons, and….! Love this! I use stencils to create dimensional backgrounds for cards and tags. I also use my stencils for creative fun on bare wood and terra cotta. Endless fun! Rebekah I love your new stencils, I could get my hands already on two, comes a but slower to overseas, but I had to try them out as well, so I used your love post in my art journal and I used your gothic romance on a mixed media canvas of mine. I am a fan of TCW stencils, I use them in all kinds of art, from canvases, tags, cards to my art journal. Very cool idea and I Love your stencils!!!!!!!!!!!!! So far I’ve mostly used stencils for paper arts – cards, art journal pages, etc. and for canvases. Love to use stencils since a little while. Why did it took me so lang to start with them??? No idea but now I like to use them on most of my projects. I too, love the Mandala design. So versatile. 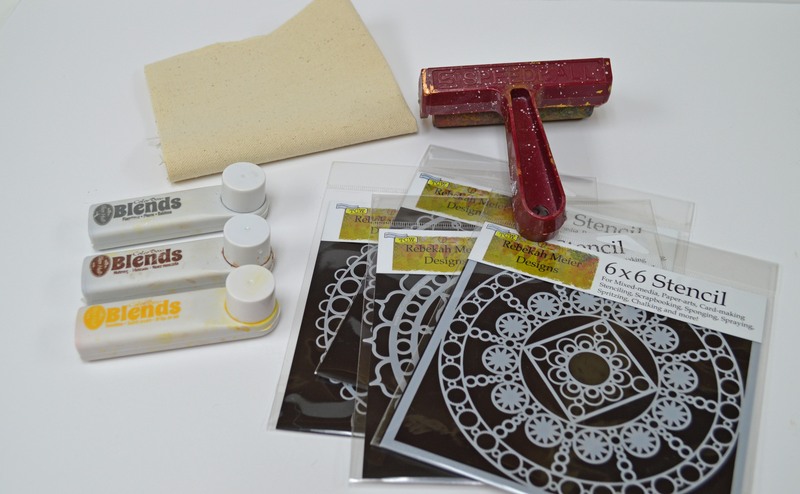 These stencils are a great size for so many projects. I enjoy dyeing fabric and collage work. I first spotted your stencils on Vicki O’Dell’s Facebook page and fell in love with them! I really like the canvas pillows you made with your stencils you designed. I don’t have any stencils, yet. I have been trying to rein myself in and have tried to resist buying any more “craft stuff” for awhile…..too long of a winter stuck indoors with the internet close at hand and craft stores far away :-). I can feel my resolve weakening. ;-). There are just so many ideas of what to do with them! I love these stencils…I have a few of them already and appreciate learning new ways to use them! I love these stencils and already have a few of them…appreciate seeing new ways to use them! Love working with stencils!!!! 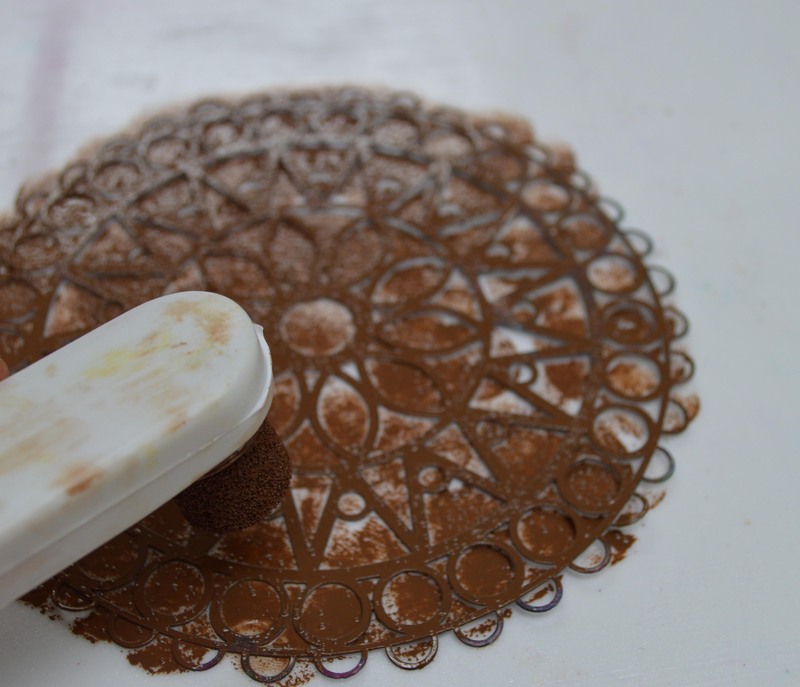 I use them a lot in working with plaster on canvas, both as a stencil and as a stamp. Two friends and I own your 1st fiber art collage book. We take turns picking out a technique and then we each execute three 6×9 pieces. One piece is to keep, the other 2 we swap amongst ourselves. It is soooo cool to see how each of us comes up with something so different with the same basic instructions. Eventually we will each have a fabulous fiber art book. THANKS SO MUCH FOR THE INSPIRATION!!!!!! We are huge fans of your work. I’m excited to see your new stencils! Love your work. I’m just getting on the stencil bandwagon and wish I had every one that comes along. Mostly I’ve used them in my art journals, but eager to try stencils with my Gelli plate and now this print technique. I love your Fabric Collage books and think I should use one of your stencils in a collage. Thanks for all your inspiration! Great pillow Rebeka.. I love how you’ve made it so you can use it inside or outside. I can see this done up with some really bright greens, yellows, blues and oranges for a real summery look. I’m just beginning to get into the stencils but have used them on cards. I’m trying to work up the courage to try some mixed media on canvas. lol Thanks for sharing with us and thanks for the chance to win some of your amazing stencils. Congratulations Rebekah on hosting your first blog hop using your amazing stencils designs from The Crafter’s Workshop. I absolutely adore your Mandala designs. They are so zen! I love to use stencils in my art journalling, on mixed media home decor projects, especially storage, & have recently started to use them with air dry clay. Wonderful technique! I mostly use my stencils for scrapbooking/cards, but I have been wanting to try fabric too. I love how you used different (but coordinating) stencils and colors as a print for the pillow! I might have to try that. I use stencils in my mixed media paintings, my art journal, and for creating art tags that I give away to others. 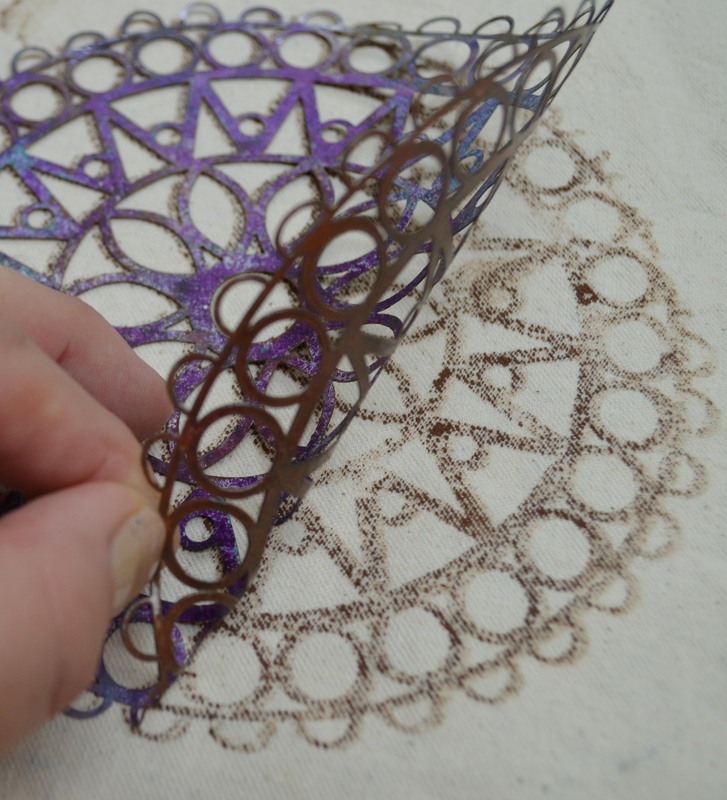 I adore mandalas and often create my own but what a great thing to have them as stencils to make images quickly! I use stencils in my art journal and on my gelli plate. Great idea! There are almost endless ways to use a stencil. I get ‘locked in’ to using them one way and forget how versatile they are. Thanks for a chance to be drawn! beautiful! I’m afraid I would not have a clean canvas when finished, though, like yours. I just bought two of your new designs on Saturday and am using one tonight as background on a journal page.. loving them so much! What a beautiful pillow! I’m definitely going to have to try that. I use stencils in my messy mixed media canvases, art journals, and to spiffy up boxes for shipping! I mostly used stencils for mixed media but after seeing the pillow I might just have to try other things. I already have several of these stencils and I love using them and my other stencils to create pages in my art journal! Love this blog hop to learn new ways to try them. That pillow is LOVELY! I have two of your stencils in 12×12 and am trying to find more things to put them on I LOVE the Specimens Stencil and the Gothic Romance… now I see some more to add to my collection! Of course I love what you did Rebekah. The stencils are so very easy to work with. Thanks so much for including me in this first blog hop. Thank YOU Madeline! I love your work! I’ve only been able to locate one of these terrific stencils. I used it in my art journal today. Tomorrow I plan to use it with powdered sugar on a brownie cake. I love the technique you used, your project and your stencils….thank you for asking me to be part of the Hop! I mainly use stencils on painted furniture. I’m loving your stencils, they’re really great designs. great idea to use them to print, love the soft colors too. Wow I love all of these stencils. So many ways to use them. I have been playing with the deli paper using stamps. So fun. Would love a chance to try it with your awesome new stencils. Thanks! Enjoying seeing all the creative ideas on the hop! Such talented artists and now so much inspiration. Thanks for putting this together…and for the giveaway! The stencils are amazing. I was just reading about a technique from Denise Clason Studios…how fun! I’m going to have to try my hand at this new way to work with stencils! Thank you for allowing me to be a part of your blog hop, Rebekah! I absolutely loved playing with your stencils. I have never worked on fabric, but your pillow is fabulous! Will have to try! I currently use my stencils in my art journal and in card and tag projects. I love stencils and would love to use yours!! Thanks for the opportunity! I would use these on some unfinished wood furniture. Especially with craft ink! I am giddy just thinking about all the fun stuff I could make with these stencils. Thanks for making the giveaway of your gorgeous stencils possible, Rebekah. Loved the post on how you used them. I would use them in my mixed media and fiber art projects. I love what you’ve done with your stencils – I’m off to see how the others have used them! Beautiful pillow! I have these stencils and love them for srapbook pages! Beautiful project! I can see some acrylic dreamcatchers hanging from my Daughter’s window sill using these fabulous stencils! These are beautiful! I’ve been learning about mixed media and making canvases with them but I hadn’t though about canvas material being used for pillows and then using your beautiful stencils in this manner! Awesome!! Loving all the creative ideas for using your fab stencils. What about drawing around the stencil and doodling or Zentangling inside the areas you create? Keeping my fingers crossed. I have several stencils, I love using embossing paste through them and am about to start some canvases where I plan to use several different ones. I love stencils for art journaling & on mixed media scrapbooking. It’s an obsession. Beautiful! Love the creative ideas. Wonderful stencils. I just finished the hop. WOW! I saw so many creative uses for your stencils! Thanks so much for the hop! I would use them for my art journal. I typically use my stencils to make cards or paper-crafting projects, but am always open to new ideas. I love how you printed the design on canvas. I just saw your new stencils in my local stamp store this past evening and was wondering how I would use them. Thank you for the ideas and for the giveaway. I forgot to say that I like to use stencils for creating Cards and some Mixed Media Projects!! I don’t have very many Stencils, but I’d LOVE to add to my collection!! =) THANKS for the chance to win!! I am a paper crafter, primarily cards at the present time. I can imagine some beautiful designs with your stencils! Love these stencils! I already left a comment on the TCW blog .. but I am happy I came here to see another fab use of stencils! I can’t find these stencils. Not at interweave or joggles. I like them a lot.